The overwhelming majority of dental practices rely on server-side software architectures that are expensive to maintain, cumbersome to use, and slow to update. iDentalSoft enables dentists to easily transition from legacy on-premise servers to modern cloud-based software and reduce the burden and costs of IT. iDentalSoft is the most comprehensive, easy-to-use and secure dental practice management platform on the market today, with a wide array of features to streamline front office workflow, improve clinical efficiency, and boost production. Office staff can access and manage practice information anytime, anywhere and on any device, including patient schedules and communication, treatment plans, x-rays, lab cases, billing and credit card payments, and more. iDentalSoft is the leading cloud-based dental practice management solution that enables any sized dental practice to reduce IT costs, operate more efficiently, and improve the patient experience. The platform’s comprehensive feature-set includes online patient portals, electronic patient communications, HIPAA secure email attachments, native imaging, online bill pay, employee management, lab case tracking, treatment planning, insurance eligibility, eClaims, reporting, reputation management, and more. The company was founded in 2010 with offices in Milpitas, CA and Overland Park, KS. For more information, visit http://www.identalsoft.com. Founded in 1996, FCA Venture Partners has a long history of investing in successful healthcare entrepreneurs. The firm is passionate about building sustainable businesses and providing strategic value to their portfolio companies. FCA invests $3-6M in fast growing healthcare companies making processes in the industry faster, better, and cheaper while improving the quality of care and the patient experience. With its location in Nashville, roots with Clayton Associates and the McWhorter Family, and deep involvement in the growth of the U.S. healthcare community, FCA Venture Partners is poised to take advantage of disruptive opportunities that help move healthcare forward. For more information, visit https://www.fcavp.com. We've been busy at iDentalsoft, and wanted to share with you some of the latest features and enhancements to our software that have been made over the last 12 months! Enhanced User Interface – Our intuitive interface has gotten even easier to use and navigate, making even difficult tasks easy. CMS1500 Medical Form Submittal – Now you can submit medical claims through iDentalSoft for a higher acceptance rate and better reimbursements. Email & Text Communication – Communicate with your patients more efficiently by texting or emailing them directly from their patient profile in iDentalSoft. You can also send attachments such as statements, x-rays, etc. Of course, these attachments can be secured with 2-factor authentication. Secure 2 Factor Authentication Email Attachments – You can now communicate sensitive data like x-rays and treatment plans even more securely with your patients. Correspondence Letters – With one click you can now send treatment correspondence letters with attachments to your referring doctors. The entire history of these communications is accessible under the patient profile. Attachments are secured with 2 factor authentication for the highest level of security for your office and patients. Customizable Patient Portal – Seamlessly accept new patient registration forms and incoming appointment requests directly into iDentalSoft. Electronic Signatures – Seamlessly collect electronic signatures for treatment plans and other patient documents. 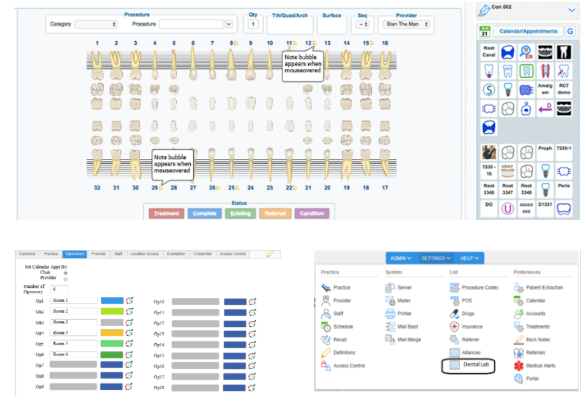 Perio Chart Enhancements – One click converts any Perio Chart into a pdf email attachment that can be sent to any patient or referring doctor. All communications and attachments are saved under the patient file for easy record keeping and retrieval. Paperless Document Center – Scan your physical documents directly to iDentalSoft for electronic storage and retrieval. Save time and money by having instant electronic access to your records. HIPPA Mask View – Hide sensitive patient information on the Scheduler to keep you in compliance with HIPPA. To see a demo of these recent updates you can schedule a demo here. iDentalSoft has been busy this month, and we’re excited to announce the features we’re enhancing to help you further streamline and secure your back office. Perio Charts are a standard offering in your iDentalSoft system, and we’ve enhanced this feature to include diagnosis tools as well. You can now add overlays to show the progress occurring between patient appointments. You can also update records with voice verification input process to help make sure hygienists and other doctors can follow your records and navigate a patient’s mouth more easily. With just one click, you can convert any Perio Chart into a pdf email attachment for your patient or a referring doctor, and all communication and attachments will be saved within your patient’s file for easy, accurate record keeping. he iDentalSoft Local Cache Image enhancement ensures that you will never lose an X-Ray image if your internet connection fluctuates or goes down. Twain images are captured and cached locally on X-ray computer to ensure image is successfully captured and available, even if you’re offline. DentalSoft has completed updates to its system so you can process payment with confidence and be in compliance with PCI security regulations in your practice. The iDentalSoft Time Clock feature has been enhanced to be more effective and user-friendly for your employees. Your staff can now clock in on from any work station or even enter their time on a mobile device. Time Clock now supports weekly, monthly, bi-weekly, and bi-monthly pay schedules and you can edit, print, or email timecards directly from the system. This enhancement is designed to give you more flexibility in your time clock and help your staff track their hours more efficiently. iDentalsoft is pleased to announce the great new system features that we are releasing in June! This month, you’ll be able to access your Document Center and use our new selectable PDF pages tool. The iDentalsoft Document Center gives you a secure place to store patient records, scans, and reports without having to spend time making paper copies and filing them away in a cabinet. Instead, you can use this feature to scan documents directly into the system, or even upload them from your tablet to your iDentalSoft system. Document Center also makes it easy for you access your important records and documents no matter where you or your office staff are-office, home, or even from a mobile device. You can upload and share documents as well, so that you can communicate with your employees and other dental professionals, no matter where they are located. This month, we’re also releasing our selectable PDF pages functionality. With this system tool, you can choose specific pages you need from a larger PDF file, and then send them to staff, patients, or other dentists for collaboration. This means you don’t have to send huge files with extraneous information or extra pages-you can just select and send the exact pages of information that you want. Used together, Document Center and Selectable PDF pages will help you keep your documents organized, secure, and easier to share for giving patients information or collaborating with other dental professionals. Try out these great new features today! 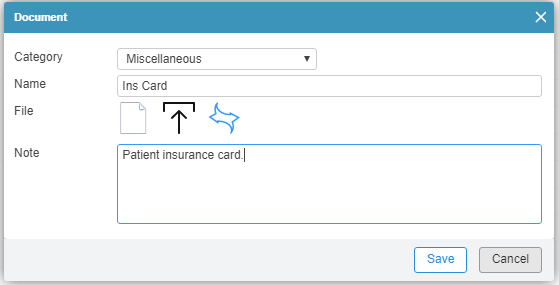 iDentalSoft just released a great feature that will make your communications with patients more effective, meaningful, and fast. Our One Click Communication feature makes your iDentalSoft solution even more effective by turning it into an efficient communication hub where you can send emails or text messages directly to your patients with just one click. This feature has an array of uses that will help make patient communications more efficient for you, and more convenient for your patients as well. This feature will save you time and make all your patient communications more efficient and convenient so you can focus on delivering excellent dental care to your patients. Try out One Click Communications today! You have to market yourself in order to grow your business. You know that’s true. But sometimes life gets in the way and your grand plans for ad campaigns end up in the basement next to the never-used treadmill and your “I’ll start tomorrow for sure” diet. So how can you balance the challenge of growing your business with the demands of actually running your business? You can create a successful marketing strategy by simply making better use of the data you already have. ﻿How many times have you explained the virtues of dental implants or answered questions about teeth whitening, only to have these expressions of patient interest lead to nowhere? What if you could easily keep track of who’s asking about, or who is in need of, what services and create targeted email blasts to reach these people? A short, well-written, informative email message describing the benefits, risks, and costs of procedures can go a long way towards convincing a patient to schedule an appointment, especially if you include a promotional offer for the treatment. The time it takes for you to compose these messages will pay substantial dividends if you are able to send them out in an appropriately targeted way. This is where a powerful, comprehensive dental practice management software, like iDentalSoft, can really go to work for you. Once you’ve written your informational message, iDentalSoft can help you cull your patient list and get your message out to the right people. sing iDentalSoft’s powerful, comprehensive automation features and availing of the security and convenience of its anytime, anywhere access will help you get the word out about how your practice can help patients be champions of dental hygiene, which will get more appointments on the books and more cash flowing through your practice. Did you know that 60% of dentists will experience some type of fraud in their career? That means 3 out of 5 dental practices will fall victim to financial crimes. David Harris, CEO of Prosperident, the world’s largest dental embezzlement investigation firm, states that dentists are particularly vulnerable to attack because of how insurance claims are processed and submitted and that the vast majority will recover pennies on the dollar, if anything, from their losses. Furthermore, the dentist, as proprietor, is liable to the insurance companies regardless of any actual complicity in the crime. So your best bet is to stop fraud from happening in the first place. But how? You must be able to track and restrict everything your employees are doing, including billing, insurance form submission, and access to patient and company data. ﻿Dental practices are often run in such a way that it’s easy for embezzlers to do their dirty work without getting caught over long periods of time. Ask yourself, can your employees access your entire pool of patient and business data, either through hard copies or through your dental practice management software? Are they submitting insurance claims by hand? Do you have any way of tracking or restricting what they’re doing that doesn’t involve you standing over their shoulders all day? What you need is a dental practice management software system like iDentalSoft, which features multiple layers of security and allows you to restrict and track data access so that you are always on top of who is doing what and where. Role-based security: Each employee’s login can be configured to define what data it can access. Location-based security: You can restrict a login’s geographic access. Device-based security: You can configure your in-office tablets to be barred from logging in to your system from other locations. Printing security: Restricting the ability to generate hard copies keeps the data safely inside the system and under your control. Activity logging: iDentalSoft will track each user’s activity to create an auditable trail. Backup restoration restriction: Both auto and manual backups are encrypted with license keys, so they cannot be stolen and restored to any server. HR Features: See at a glance who is coming in early, staying late, or skipping vacations, or letting their certifications lapse. Such suspicious behavior may be an early warning flag that could help you prevent disaster before it happens. e-Claims Filing: Filing insurance claims electronically is not only easier and cheaper but also safer. You’ll have an easily trackable, searchable trail of submitted claims, making fraud much harder to hide. iDentalSoft’s multi-layered security features make it easy for you to track and restrict data access and usage, which in turn makes it much harder for embezzlers to victimize your practice. Managing patient reviews is crucial to ensuring patient satisfaction and growing your business. You don’t need a full-time social media consultant to take advantage of the business-building opportunities afforded by a dynamic online presence. With iDentalSoft’s built-in Reputation Management module, you can easily put your patients to work for you! You’ve probably read about big companies like Target or Anthem getting hacked. You may even have been personally affected by these security breaches if your personal information was in these databases. Stories like these may be why you’ve been afraid to move your dental practice data to the cloud. Big pools of data like those stored in public cloud databases are appealing targets for both hackers and the government. Most cloud-based dental practice management software systems will pool your data with that of their other clients to reduce hosting costs. This is called a public cloud hosting scenario and it poses several intrinsic security risks. First, the larger the pool of data, the more appealing it is to both criminals and the government, both of whom have limited resources. Why go to all that effort to either hack or monitor only a small amount of information? Second, suppose another dental practice with whom you are sharing a cloud database becomes the target of an IRS or criminal inquiry. Armed with subpoenas, the government will gain access to the entire database in which the target company’s information is stored, making it possible for your data to fall under scrutiny in the course of the investigation as well. Third, residual data will remain on a shared database even if you discontinue using the service. This is because hosting companies do not get rid of a server just because one client isn’t using their part of it anymore. So your data may be deleted after you leave, but it may be later recovered. A private cloud database contains only your information in a segregated piece of hardware that can be under your both your electronic and physical control. You want all the advantages of the cloud: remote, anytime access, automatic, encrypted, and redundant backups, reduced IT costs, and easy setup and maintenance among multiple locations. You just don’t want the security risks of having your data pooled with that of other dental practices, or any other companies, and out of your personal control. It is your responsibility to be HIPAA-compliant by keeping your patients’ medical records and personal information safe. HIPAA doesn’t care that locking your file cabinets at night used to be good enough. It’s 2016 and HIPAA expects the patient data under your control to be professionally secured from loss or theft. You need a powerful dental practice management system like iDentalSoft that uses a private cloud data storage system to help you maintain compliance with HIPAA regulations for patient data storage and to safeguard your data from government monitoring and criminal hacks. A private cloud system gives you the best of all worlds: security, control, and freedom. With iDentalSoft’s industry-first private cloud storage database system, your data is completely organized, totally secure, always accessible, and entirely under your control. Contrary to what you may believe, your practice will not collapse in flames if you take a day off. In fact, it’s well established that some time away to clear your head is rejuvenating and ultimately beneficial to your ability to be productive at work. But wait, you may be thinking, how can I possibly leave when there are so many things going on that I need to monitor and make decisions about? Imagine having anytime, anywhere access to your entire practice, from any device. With a complete dental practice management software solution like iDentalSoft, you can do so much more than just see the day’s schedule from your phone. Instantly pull up patient charts, treatment plans, and images, allowing you to easily weigh in on emergent situations. Using iDentalSoft’s powerful, comprehensive automation features and availing of the security and convenience of its anytime, anywhere access will allow your practice to keep running smoothly and the cash to keep flowing in even while you’re away. Better access for your patients, less work for you and your staff! Save time on patient administration and keep your patients happy by letting them request appointments, register and sign consents, and make payments at their convenience through our secure Patient Portal. Native function, so no need to share data with an unsecured third-party program. It doesn’t matter if your schedule is packed with big-ticket procedures if you can’t get your patients to pay their bills. But with dental insurance getting harder and harder to come by, and procedure costs rising, how can you help your patients meet their financial obligations to you? For simple procedures and routine cleanings, it is usually pretty straightforward to get patients to pay at the time of service. But what about for more complex treatments, whose costs run into the thousands and more? Many patients will be unable to pay such sums out of pocket all at once. They may therefore either avoid having the procedure in the first place, which means a loss of business for you, or else will allow their accounts to become delinquent, necessitating that you send out multiple payment due notices and engage in other time-sucking efforts to get paid. The best way to get paid quickly and easily is to have a dental practice management system with an integrated credit card payment option that has the capacity to set up an auto-bill payment plan, like iDentalSoft. Patients can log in to the Patient Portal and pay their bill whenever it’s convenient, without having to write a check and look for a stamp. You can offer payment plans for the really expensive treatments, which will make patients more likely to feel they are able to get treatment to begin with, and which will ensure consistent cash flow as each installment will be auto-billed to the patient’s credit card. This way, there is no disruption due to any human-error delays in your office sending out notices or your patient forgetting to make an installment payment. iDentalSoft’s powerful, completely integrated system makes it easier for patients to pay you and automatically keeps track of payments and accounts so you can focus on patient care and growing your business while the cash rolls in on its own. No more redundant data entry and cumbersome, out-of-sync servers for all your locations! Efficiently manage all of your locations from one centralized database. Making it easier for your patients to pay will get you paid faster and with less effort! Taking and accessing dental patient images has never been easier! Save time and money by managing images directly through iDentalSoft using equipment you already own.